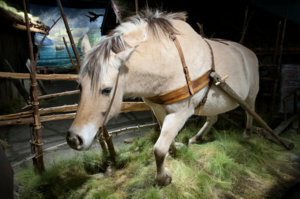 This popular exhibition portrays the everyday lives of the people who have inhabited our country, from the Ice Age to our time. Sounds of melting and dripping water surrounds you when going out of the light blue glacier and into the Stone Age. See examples of the amazing rock carvings and see how the first Norwegians started to cultivate the land. Light, sound, smell, photographs and models stimulates the imagination as we go forward in time. Several films give you a better understanding of important events and eras. We go into the late Middle Ages and a dark time for Norway. The meeting with the Black Death makes a strong impression. On your way through history you feel the smell of tar tear in my nose when passing boat builder from the Viking Age. The squeak of the boards when you go over the pier in Lofoten. When we enter World War II you can feel the shaking when a torpedo is exploding. The gaze is directed towards everyday life during the war. Then the rhythms of the Rolling Stones brings you through the post-war period. In postwar Norway former luxuries become common property. Here you get to see the popular Volkswagen from the 1960s again. Owning yourown car is getting common, and this change people's habits. The end of the exhibition brings you into your own future with the quiet room, with paintings by the Norwegian artists Jakob Weidemann and Carl Nesjar, music by Arne Norheim and poems by Rolf Jacobsen. 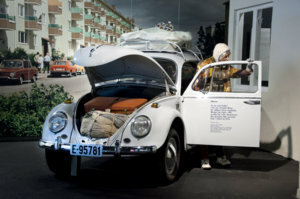 The VW "from We won the land". Photo: Camilla Damgård/Maihaugen. Read about our other exhibitions here.